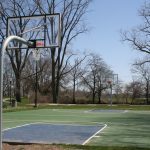 The basketball courts are located in Village Park in the heart of downtown Whitehouse. They recently received a much needed face lift and were resurfaced and the goals were replaced. Come enjoy the new basketball courts!